The winner of the Arnold Palmer Trophy for topping the PGA Tour’s official money list in 2010 is a shining example of how to cope with the twin imposters of triumph and adversity. Paul Trow discovers that patience is now paying off for the man his fellow professionals all look up to. If ever confirmation is needed that golf is a capricious mistress, a game of wildly fluctuating fortunes where nothing can be taken for granted, just ask Matt Kuchar. Few PGA Tour members have taken this truism to heart as intently and as philosophically as the affable young man with a ready smile who sits alongside me in the clubhouse at the PGA West resort in La Quinta, California. “Ups and downs” is a phrase he uses often during our conversation, which took place after a neat, below-par round at the Bob Hope Classic. Of course, for many players at this level an ‘up’ can be a top-25 finish, a rare flash of bloom in an ever-expanding nettle bed of ‘downs.’ In this particular case, though, it’s an entirely different story—a high-altitude tale of tailspins and vaulting achievements. It’s just over a decade since Kuchar, now 32, turned professional following a stellar amateur career. At the time, it seemed unlikely he’d have to wait long for his first professional victory and he duly delivered at the Honda Classic in the spring of 2002. What happened next baffled most people around the PGA Tour—the form that had blessed him all his life disappeared overnight and for the next three years he was an ‘also ran’ at best. In 2006, his exemption expired and he found himself camping out on the Nationwide Tour. As it happened, the feeder circuit, populated in the main by veterans marking time before one last tilt at glory on the Champions Tour and ‘eager beaver’ college graduates trying to learn their trade, provided the springboard for an astonishing renaissance. Tenth-place in the money list gained Kuchar redemption, and there was a victory to celebrate along the way—in the Henrico County Open at the Dominion Club in Richmond, Virginia. He consolidated his status over the next two seasons, finishing 115th and 70th in the order of merit, before claiming his second PGA Tour title in 2009 at the Turning Stone Resort Championship in upstate New York. The rest of the story to date is as rosy as our hero’s cheeks, culminating with a whole bunch of bouquets in 2010. In addition to finishing No.1 on the PGA Tour money list (for which he won the Arnold Palmer Trophy) with earnings of just under $5 million, he also walked away with the Vardon Trophy and Byron Nelson Award (for lowest stroke average—69.61), and made his Ryder Cup debut. And there was more: Not only did he win The Barclays, the first of the FedExCup playoff tournaments, but he clocked up a further 10 top-10 finishes, two of them in majors. No money list was ever won by a flash in the pan, and this level of consistency suggests that Kuchar is well placed to extend this current ‘up’ in his life for the foreseeable future. Certainly, he has started 2011 in the same vein with four more top-10s from his first six starts—ties for fifth, sixth and seventh in the Sony Open, Hyundai Tournament of Champions and Bob Hope Classic respectively along with the victory over his Ryder Cup team-mate Bubba Watson for third place in the WGC-Accenture Match Play Championship that propelled him for the first time into the top-10 of the official world golf ranking. “It’s been a great start to the year following a fantastic 2010. I took from the end of October off till now [mid-January] and I wasn’t sure how my form would be at the start of 2011 after such a long break, but it feels to me like it’s still 2010,” Kuchar acknowledges. “I was really pleased with how 2010 turned out, particularly the number of top-10s I had. That was a good indicator of consistency. I take a lot of pride in playing consistently, and this is what enabled me to win the money list. 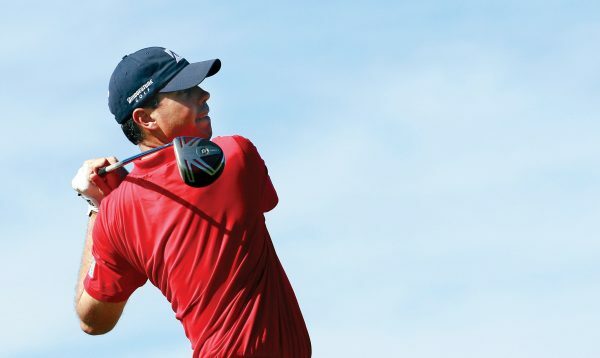 “It was also a thrill to make the Ryder Cup team [he took two points out of a possible four]. Normally when I finish a round, I go home, eat dinner and go to bed. So it was pretty cool to hang out with the best players in the world for that week in Wales. The Europeans travel so much more and so much further than we do, so traveling with their families as much as we do with ours on the PGA Tour is more difficult for them. Forever with Kuchar, his pronouncements seem to be understatements—a word of caution here, a refusal to get carried away there. His remarks are as measured as his gait while plotting his way, thoughtfully, through a round. This is an integral part of his temperament, of course, but it’s also a legacy of the scar tissue that remains from the times when things weren’t quite so good. Indeed, he has a maturity beyond his years and an elegance of demeanor that will stand him in good stead if, as many observers expect, he stays at the top for the long haul. “Golf is a funny game to play for a living—it’s a great life but it’s hard to have a good year every year,” he warns. “There are certain lessons you need to learn and one is that you’re going to have your ups and downs. At college I had good and bad years too. “Things can change at any time. When I go out to play golf I want to do a good job of focusing on my game, but I can only control what I do. My philosophy is that the rest of what goes on is beyond my control. I add up the strokes in the scorers’ tent, and then they tell me where I finished in the tournament. But this is no puritan delivering a virtuous, utilitarian sermon from his pulpit. Kuchar is a balanced, civilized individual with a taste for the finer things in life. For him hard work is a means to an end, and the end is what he truly values. Kuchar’s rebirth began, by his own admission, when he was plowing the Nationwide Tour furrow in 2006. “That’s where I started to play good golf again and gained confidence,” he says. The key to this, it seems, was a change of coach. “I’ve been working with Chris O’Connor, who is based in Dallas, since 2006. He was recommended to me by one of my old Georgia Tech mates, Matt Weibring. Over the previous year or so, I’d seen a couple of instructors who kept telling me to do the same things and I have to say I was having trouble doing what they told me. Pundits agree that Kuchar, who stands 6ft 4in, now attacks the ball with a much flatter trajectory, but there is no questioning the consistency with which he finds the target compared to his earlier years as a professional. There is also a consistency and calm to his personal life that must settle him in the heat of battle. He was born and raised in Winter Garden, FL (just north of Orlando) and is married to Sybi, who he met while studying business management at Georgia Tech. Their two sons—Cameron, 3, and Carson, 1—nearly always accompany Dad when he goes on Tour. But Kuchar is aware this idyllic state of affairs cannot last for ever. “I like having the family with me but I’m not sure what we’ll do when school age kicks in because they won’t be able to travel as much. I’m kind of nervous about that,” he admits. Possibly with this in mind, the Kuchar family moved late last year to St. Simon’s Island in southern Georgia where Sybi was born and raised. “We moved into a new house there. It’s a beautiful place with a lot of great golf courses.” It’s probably also got a few tennis courts, which is one reason why the couple got together in the first place. “At Georgia Tech I enjoyed playing tennis,” Kuchar says, “but I got to playing a lot more after we started dating. She played for the college team. She doesn’t play much now because she has the boys to look after, but I still believe she could. “I played a lot of tennis growing up and still do. My Dad was a tennis player at Heathrow in central Florida—he was No.1 in the state as a doubles player in the 35 age group. Seasoned followers of golf will remember Kuchar’s father for the enthusiastic way he caddied for his son when he finished low amateur and in a tie for 14th at the 1998 U.S. Open at Olympic in San Francisco. The joie de vivre of those far-off days is a joy to recollect. Two months earlier Kuchar, a two-time All American who earned his passage into these iconic events by winning the 1997 U.S. Amateur Championship at Cog Hill G&CC near Chicago, had finished low amateur in the Masters (tied 21st). At the end of the year he was a shoo-in to win the Fred Haskins award as the top collegiate golfer and in 1999 he played in the Walker Cup at Nairn in northeast Scotland. After graduating, Kuchar worked for a year as an investment banker for Liberty Associates in Boca, Florida. “I wanted to learn the business environment and perhaps follow the Bobby Jones plan [of playing at a high level as an amateur]. I nearly left college early to turn pro, but the prospect of playing in the U.S. Opens of 1998 and 1999 persuaded me to stay amateur. “Playing in the Masters was an amazing experience—the rounds would end so quickly because I was walking on clouds all day. Playing in the U.S. Open at Olympic in 1998 was different, very exhausting. I played even better there, but the course was so difficult. “But when I was working, I was spending a lot of time reading proposals and what golf I was playing then was mainly business golf. Yet I was still trying to compete seriously. Then I got a sponsor’s exemption into the Texas Open at San Antonio in 2000. I missed the cut but I didn’t disgrace myself and I found myself upset that I wasn’t playing the next week because I wanted to find out if I was good enough to play at weekends. It was then that I decided to turn professional. He’s playing with them again now—and beating them. Golf sure is a game of ups and downs. As with all successful golfers, Matt Kuchar has a number of endorsement contracts with blue-chip companies. Leading the way is the Royal Bank of Canada, who at the turn of the year added his name to a roll call of players that includes Ernie Els, Jim Furyk and Luke Donald.